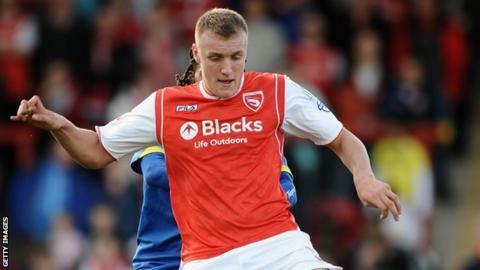 Jack Sampson's last-minute header gave Morecambe a deserved point against League Two leaders Scunthorpe. The Iron controlled the first half and led at the break through Sam Winnall's 23rd goal of the season when the striker headed in Paddy Madden's cross. Morecambe improved markedly after the interval, with Iron keeper Sam Slocombe making four outstanding saves. Kevin Ellison had a goal chalked off after the referee failed to play an advantage but Sampson saved a point. The result sees Scunthorpe stay two points clear at the top of the table and extend their unbeaten run to 27 matches while Morecambe move three points clear of the relegation zone. "Credit to the lads, they kept going right to the end. The amount of times we've come back from losing positions is fantastic. "We kept plugging away, we changed the formation and got all our forward players on. "Every time we got past the back four, the goalkeeper pulled off some world-class saves. "We got the important goal at the end and that got us an important point." "You have to credit Morecambe, they threw the kitchen sink at us, as teams do, but it's disappointing, really disappointing, because we are so close. "We know we are so close to getting over that line, that extra two points makes a huge difference. "In a nutshell, we are 94 minutes in at 1-0 and we've got to see out two minutes in a game and we've not done that. "You know, it's a little bit embarrassing, it has happened too many times this season. We have to stay positive and we have to regroup again on Monday." Match ends, Morecambe 1, Scunthorpe United 1. Second Half ends, Morecambe 1, Scunthorpe United 1. Goal! Morecambe 1, Scunthorpe United 1. Jack Sampson (Morecambe) header from the centre of the box to the bottom right corner. Assisted by Jamie Devitt with a cross. Corner, Morecambe. Conceded by Sam Slocombe. Attempt saved. Mark Hughes (Morecambe) right footed shot from the centre of the box is saved in the top centre of the goal. Terry Hawkridge (Scunthorpe United) is shown the yellow card. Foul by Terry Hawkridge (Scunthorpe United). Attempt saved. Jack Redshaw (Morecambe) left footed shot from the centre of the box is saved in the top right corner. Substitution, Scunthorpe United. Luke Waterfall replaces Matthew Sparrow. Corner, Morecambe. Conceded by Eddie Nolan. Corner, Scunthorpe United. Conceded by Shaun Beeley. Sam Winnall (Scunthorpe United) wins a free kick on the right wing. Jack Redshaw (Morecambe) wins a free kick on the left wing. Substitution, Morecambe. Jack Sampson replaces Andrew Wright. Foul by Paddy Madden (Scunthorpe United). Hand ball by Matthew Sparrow (Scunthorpe United). Attempt saved. Ryan Williams (Morecambe) right footed shot from outside the box is saved in the top right corner. David Mirfin (Scunthorpe United) is shown the yellow card. Hand ball by David Mirfin (Scunthorpe United). (Morecambe) wins a free kick in the attacking half. Foul by Paul Hayes (Scunthorpe United). Corner, Scunthorpe United. Conceded by Alex Kenyon. Jordan Mustoe (Morecambe) is shown the yellow card. Foul by Jordan Mustoe (Morecambe). Substitution, Morecambe. Jack Redshaw replaces Andy Parrish. Substitution, Morecambe. Ryan Williams replaces Padraig Amond. Andrew Wright (Morecambe) wins a free kick in the defensive half. Corner, Scunthorpe United. Conceded by Mark Hughes. Attempt blocked. David Mirfin (Scunthorpe United) right footed shot from the centre of the box is blocked. Attempt saved. Paul Hayes (Scunthorpe United) right footed shot from the centre of the box is saved in the bottom left corner. Corner, Scunthorpe United. Conceded by Andrew Wright. Attempt blocked. Matthew Sparrow (Scunthorpe United) right footed shot from outside the box is blocked.